The following bibliography is meant to cover literature on primarily peyote/Lophophora and related Mexican/Texan cactus species, but many general works on cacti are also included. The bibliography lists books and journal articles as well as relevant online material - and download links are provided for works that are publicly available online. Currently the bibliography is very much a work in progress and will be expanded in the future; it was last updated April 25, 2013 and contains 74 entries. Please let me know if you encounter any stale links or have additional references. Anderson, Edward Frederick (1961). 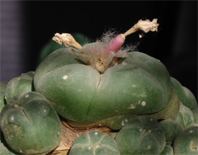 A taxonomic revision of Ariocarpus, Lophophora, Pelecyphora and Obregonia (Family Cactaceae). Ph.D. Dissertation, The Claremont Graduate University. Boyd, Carolyn Elizabeth (1998). The Work of Art: Rock Art and Adaptation in the Lower Pecos, Texas Archaic. Ph.D. Dissertation, Texas A&M University. Britton, Nathaniel Lord & Rose, Joseph Nelson (1920). The Cactaceae - Descriptions and Illustrations of Plants of the Cactus Family, Volume II. Washington, D.C: Carnegie Institution of Washington. Britton, Nathaniel Lord & Rose, Joseph Nelson (1923). The Cactaceae - Descriptions and Illustrations of Plants of the Cactus Family, Volume IV. Washington, D.C: Carnegie Institution of Washington. Kunte, Libor & Šedivý, Vladislav (2002). Genus Ariocarpus Scheidweiler - Kaktusy Special 2. Society of Czech and Slovak Cactus and Succulent Growers. Obermeyer, William Robert, Jr. (1989). Enhancement of growth and alkaloid production in tissue cultures of peyote, Lophophora williamsii (Lemaire) Coulter. Ph.D. Dissertation, Philadelphia College of Pharmacy and Science. Terry, Martin Kilman (2005). A tale of two cacti: studies in Astrophytum asterias and Lophophora williamsii. Ph.D. Dissertation, Texas A&M University.